Your smile is the gateway to your personality, and guarding it misleads the world from your true persona. Our patients come to Dr. Joshua Stelzer for cosmetic dentistry because of his ability to craft dull, dingy smiles into a masterpiece. You can even take a glimpse at our smile gallery to witness why our patients trust Dr. Stelzer as their go-to dentist near the Ambler area. In fact, you can learn about the transformation made on one of our loyal patients. Our patient had a crown with a metal margin showing. She didn’t like nor feel confident with her smile, and wanted it fixed. Under the care of Dr. Stelzer, our patient received a porcelain veneer and an all-ceramic crown. Dr. Stelzer blended the veneer and crown perfectly to her natural smile where the metal margin disappeared and her true smile shined. 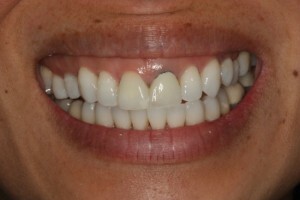 All-ceramic crowns are artistically crafted to mimic and act like a natural tooth. Dr. Stelzer works closely with high-quality dental labs to have the crowns restore the strength, function, and appearance of a natural tooth. Porcelain veneers are a conservative treatment to cover the imperfections of any smile including cracks, gaps, and misshaped teeth. It is a thin shell and resistant to staining making it a long-lasting solution. If you have a smile that’s less than perfect, call Stelzer Dental today for a personal consultation with Dr. Stelzer. He will take the time to answer any of your questions, concerns, and determine what your goals are for your smile. What would you change about your smile? Let us know by commenting below!